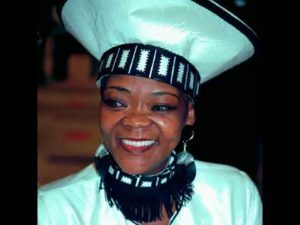 Brenda Fassie whose full name is Brenda Nokuzola Fassie was born on the 3rd of November 1964 in Langa, Cape Town in South Africa. She died on the 9th of May 2004. She was an anti-apartheid Afropop singer. Her musical career began at an early age since her mother was a pianist she started singing for tourist at an early age. In 1981 at the age of 16, she joined the vocal group Joy (filling in for one of the members who was on maternity leave) and later became the lead singer for a township music group called Brenda and the Big Dudes. Around 1991 when he divorced her husband she became addicted to cocaine and had a set back in her career. In 1995 she was discovered in a hotel with the body of her female lover, Poppie Sihlahla, who had died because of an apparent overdose. She underwent rehabilitation and got her career back on track. From 1996 she released several solo albums, including Now, Is the Time, Memeza (1997), and Nomakanjani?. Most of her albums became multi-platinum sellers in South Africa; Memeza was the best-selling album in South Africa in 1998. Fassie collapsed at her home in Buccleuch, Gauteng on the morning of 26 April 2004, and was admitted into a hospital in Sunninghill. The press was informed that she had suffered cardiac arrest but later reported that she had slipped into a coma brought on by an asthma attack. It was later revealed by post-mortem report that she had taken an overdose of cocaine on the night of her collapse, and this was the cause of her coma. She stopped breathing and suffered brain damage due to lack of oxygen. In 1985 she got a son, named Bongani Fassie, of a fellow Big Dudes musician. How old was Brenda Fassie when she died? How did Brenda Fassie die? When did Brenda Fassie die? Where is Brenda Fassie from? Who was Brenda Fassie married to? Where was Brenda Fassie buried? What is the meaning of vulindlela? Vulindlela is a Xhosa/Zulu word which means “Make way”. In the context of Brenda Fassie’s song, it means “ make the way you gossiping neighbors because my child is getting married today”.